Product Description: Make your ugly spaces pretty places with our Barricade Graphics. 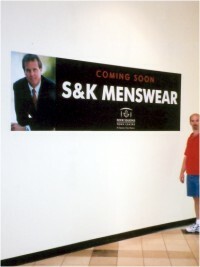 Barricade Graphics can be just about any size from one foot to 100 feet in length and any height you need. Screw-To-Wall Banner: Simply screw to your barricade wall. No special tools needed. These full color prints on durable banner material are tough enough for outdoor use, yet attractive enough for use inside the finest properties. Larger sizes may have seams but are also available using Grande Format printing for larger seamless panels - pricing may be higher. Adhesive Vinyl: Simply peel and stick in place to dress up any wall. These graphics stick and hold on tight with a permanent adhesive backing. It is recommended that the wall or surface be painted with a quality flat latex or high gloss enamel paint for best adhesion. Removable Vinyl: Vinyl film with a removable adhesive is also available for use on glass storefronts and windows. Sizes larger than 4 feet may require tiling. Custom sizes are available - please call 888-625-5744 for a free estimate. Please have your desired dimensions handy. The pricing shown below is for some standard sizes on adhesive vinyl. Grande Format seamless printing or banner pricing may be slightly higher - please call for a quote.We can print any size you need. All dimensions are rounded up to the nearest foot for pricing. Custom sizes charged by the square foot. ALL SIZES SHOWN HERE ARE IN FEET.